Atlantic Brewing/Facebook Atlantic Brewing Company, Acadia National Park, Maine: Originally called Acadia Brewing, Atlantic is sitting pretty on a 10-acre farm on the border of Maine’s beautiful, and rugged Acadia National Park. Great Northern/Facebook Great Northern Brewing Company, Glacier National Park, Montana: Located 30 minutes south of Glacier National Park, in the very cool town of Whitefish. If you’re visiting Glacier, you’re obligated to drink GNBC’s Going to the Sun IPA, named after the park’s famous road. Mammoth Brewing/Facebook Mammoth Brewing Company, Yosemite National Park, California: Good beer sits about 45 minutes east of Yosemite at Mammoth Brewing Company. Moab Brewery/Facebook Moab Brewery, Arches National Park and Canyonlands National Park, Utah: You could be drinking a beer in the Moab Brewery, in downtown Moab, and be in either Arches or Canyonlands in about 10 minutes. Oh, and Moab Brewery also makes gelato. Because Moab is hot. Nantahala Brewing Company Nantahala Brewing Company, Great Smoky Mountains National Park, North Carolina: It’s a small brewpub that focuses on sessionable beers for an adventurous demographic. And it’s about two miles from the border of GSMNP, which has some of the best hiking in the Eastern U.S. Rogue Ales Pendleton Pale Ale, Rogue, Oregon: Rogue isn’t exactly next to a national park, but they did brew this beer specifically to honor Oregon’s Crater Lake National Park. So that counts for something. Rock Cut Brewing/Facebook Rock Cut Brewing Company, Rocky Mountains National Park, Colorado: There are more high profile breweries in this neck of the woods (hello, Oskar Blues) but Rock Cut has location on its side—it’s in the middle of Estes Park, the gateway to Rocky Mountains National Park. Snake River/Facebook Snake River Brewing Company, Grand Teton National Park and Yellowstone National Park, Wyoming: Snake River has plenty of clout in the craft beer world, and the fact that they’re in Jackson Hole, one of the gateway towns to both Grand Teton National Park and Yellowstone, is just a bonus. Zion Canyon Brewing Zion Canyon Brewing Company, Zion National Park, Utah: This brewery sits just shy of Zion’s gate, in the surprisingly cool town of Springdale. You could walk from the brewery to some of Zion’s most iconic hikes. 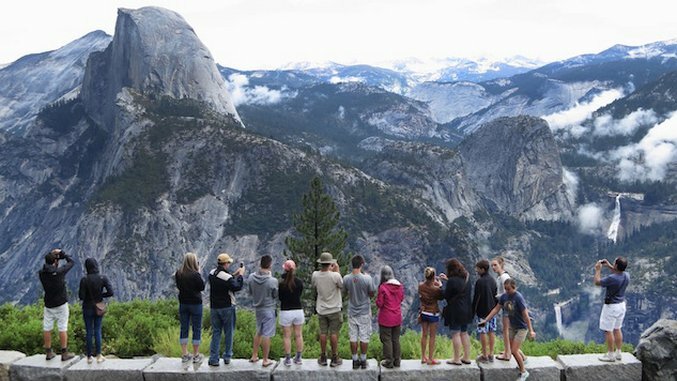 We’re in the midst of National Park Week, when all of the 58 National Parks in the system waive their entry fees. This year also marks the 100th anniversary of our National Park system as a whole. So we thought it would be a good time to highlight some breweries that have the good fortune of being located near some of the most iconic parks in the system. Scroll through the gallery and raise a glass for beer and wild, open spaces.